What a difference some TLC (Tender Loving Care) makes! When Rocca first arrived at the veterinarian clinic, she was emaciated with protruding bones due to hunger and mange-riddled with spots of missing fur. One of our Program Partner representatives, Sherry, worked at the clinic and received the original call about Rocca’s condition. Rocca clearly would not have survived without treatment. The generosity of a local woman helped sponsor Rocca’s veterinarian care, and the ROAR Program’s Foster Kit Service contributed to her continued healing. The love and care provided by the foster network obviously brought Rocca back to life. Amazingly, she is now ready for adoption, including being spayed, current on all shots, and updated on her preventative health care. This includes being tested for heartworms, treated with preventative Frontline, and micro-chipped. 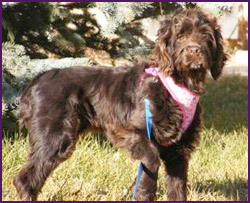 Originally, it was determined that Rocca was a Chestnut Cocker Spaniel, but after some TLC and vet care, they determined she is actually a Boykin Spaniel! According to the American Kennel Club, the Boykin Spaniel is the state dog of South Carolina, and is known for its cheerful and energetic character. Hunters respect this breed because of their hard work ethic and stamina. lovely as she was meant to be. This Program Partner serves homeless and helpless animals of the Rosebud Reservation and surrounding areas. They have a cadre of foster homes where the animals are placed until an adoption or transfer to an out-of-state no-kill facility can take place. In the September report from Sherry, there were 28 dogs and 16 cats in foster care being tended between 8 homes. Adoptions have been moving along quite well for this time of year; they placed 9 dogs in 9 weeks. But as quickly as they go out, they get replaced. They acquired 12 new dogs and one kitten shortly after the adoptions. They also transferred 10 dogs to their partner facility in Colorado for adoption. Sherry is always appreciative of the supplies delivered to her rescue. Since the beginning of the year, they have already received 5 shipments from us. Supplies include almost 1.5 tons of dog and cat food (nearly 3,000 pounds), bowls, trash cans, gloves, mats, hand sanitizer, pet blankets, pet meds for flea and tick treatments, disinfectant, dog beds, paper towels, and brochures. 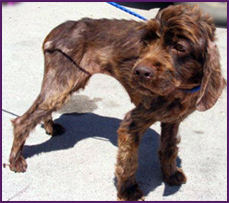 We are glad to help them reach out to hurting and helpless animals like Rocca. Without the generous support of our donors and Program Partners, success stories like Rocca’s would be far less likely. Thank you for helping to make that possible!